Imagine. Recover 20 kg of nickel per day or 100 kg of silver or 40 kg of gold. This is no longer a pipe dream. 20 years field testing of the original Ionnet makes these claims for IonnetX, the latest version of the most efficient electro-winning system yet devised, a reality. “Order of magnitude” design changes have made the IonnetX system, remarkably user friendly and reliably maintenance-free. IonnetX’s performance in a “real world” plating shop has astounded the management of one of the world’s largest nickel-chrome operations. Enormous turbulence combined with ultra-low current densities has achieved unheard of low ppm levels of nickel. Indeed, 1900 liters with a concentration of 26,000 ppm nickel was brought to below 20 ppm in about 18 hours. In the case of gold, silver, palladium and platinum, the end point is always a fraction of a ppm, and sometimes it is undetectable. The curve displayed below is an empirical representation of the copper concentration diminishing as a function of time on a daily basis. This has been repeated each weekday for six months, with slight variation. Four systems in parallel operation for nickel recovery. For those of you who are familiar with our thirty year-old Gold Bug®, one IonnetX™ is the equivalent of employing 65 Gold Bug® systems! 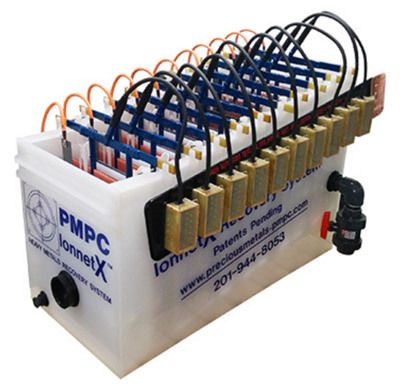 The IonnetX™ is modular and can be configured in parallel operation to double, triple, and so on, the recovery rate. Regardless of your recovery needs for heavy or precious metals, we can design the system for you. For an understanding of how the IonnetX™ works, please see the section on our Ionnet system. The concept is the same, but the execution is better and larger. Recovering these metals easily and economically for reuse or sale. The lonnetX™ system. It was designed after 15 years of observation of our earlier lonnet™ system’s performance. The lessons learned from that experience in the field were the driving forces to redesign what we felt could be done better. And the lonnetX™ is the result of all of those changes. As the metal-bearing stream enters the lonnetX™ cell, it is channeled in a serpentine path through a series of electrolytic chambers, each containing two anodes sandwiching a cathode. The turbulence created at the cathode interface insures high plating efficiency, translating into fast plate-out to very low concentrations. The metal deposits on and within the cathode. Any non-adherent solids which tend to accumulate during the electrowinning process are swept to the cell bottom and contained for convenient draining (the electrodes are raised 3” above the cell floor to eliminate the possibility of the solids causing a short circuit). Each lonnetX™ cathode can hold up to thirty five lbs. of metal (depending upon several parameters), 350 lbs. for the whole cell. The system is designed for easy access to all electrodes. What distinguishes the IonnetX™ from other electrowinning systems? Many things: The expanded-surface area cathodes, the unique solution flow design that creates turbulence, the improved contact system with quick disconnect user- friendly contacts, the direct current individual cell fusing system, the plastisol encased bus bars, to name a few. What are some of the applications for the lonnetX™? What are some of the various solution types for typical applications? Where are my cost savings using the lonnetX™ system? When you remove your metals directly from your drag-out tank by electrolysis, you say good bye to the purchase of caustic soda for precipitating your metals as metal-hydroxide sludge in batches. You say good-bye to the labor and energy required to take that sludge out of solution, dewater it, and pack it. You say good-bye to shipping these containers of waste out at all. You no longer have a landfill liability. What you get instead is saleable scrap metal. In many cases, the scrap more than pays for the operating costs of the lonnetX™ system. How low can you go and how quickly? The lonnetX system is designed to afford the best possible conditions to allow a plating rate as close to the theoretical limit as possible at various concentration levels. This theoretical limit is based on the “electrochemical equivalence” of a particular element. The point is that this system is in a class by itself in terms of speed and limits. At high amperage we are able to get full efficiency at concentrations above 1 gram/liter and at low concentrations, our efficiency while not full, is maintained so that we typically bring solution metal concentration to levels close to and often lower than 1 milligram/liter. In many cases, this is below current environmental limits of discharge. Wherever possible, the first line of attack should be electrowinning. Even if electrowinning cannot completely solve the problem, any reduction of sludge attained through electrowinning will mean a large cost savings. The lonnetX™ system is, by far, the least expensive alternative to attain this goal. Electrowinning, also called electroextraction, is the recovery of metals from solutions through the use of electrolysis. All over the planet metals are being dissolved in solutions for processes ranging from plating to anodizing to refining and more. AND THAT CREATES WASTE. But what is so special about the IonnetX™ Electrowinning System? The lonnetX™ system was designed after 15 years of observation of our earlier lonnet™ system’s performance. The lessons learned from that experience in the field were the driving forces to redesign what we felt could be done better. And the lonnetX™ system is the result of all the changes. For the first time, a high capacity system, has the ability to bring metal concentrations to compliance levels. This system will take copper, cadmium, silver, gold, and palladium down to a fraction of a part per million. This is documented. Because of the design using expanded surface area cathodes, the foot print is minimal. Our rugged design and durable components assure many years of trouble-free service. I know, I know! It took me 3 years to finally try your Ionnet System on our electro-less copper bailout, after using it for years on our silver rinses, and of course, your Gold bugs, everywhere. In the past, we had been treating this constant waste by standard means, with all the concomitant labor, chemicals, and other costs. Now, we put 400 gallons of the deep dark blue bail-out solution in a tank, just turn a switch, and within 24 hours the solution appears to be crystal clear, and the concentration of copper is down below .3 ppm! If we wanted, we could bring it down to .1 ppm or even lower. With just the formaldehyde left we could easily oxidize this, pH adjust the solution, and dispose directly to the sewer…if we had a sewer! That is how well this system works. It’s so straightforward and simple, and of course maintenance free. This has changed everything! Kudos to you.